AUTHOR INFORMATION: Christopher Paolini was born in Southern California. and has lived most of his life in Paradise Valley, Montana with his parents and younger sister. Christopher was homeschooled by his parents and some of his favorite books were Bruce Coville's Jeremy Thatcher, Dragon Hatcher, Frank Herbert's Dune, and Raymond E. Feist's Magician, as well as books by Anne McCaffrey, Jane Yolen, Brian Jacques, E.R. Eddison, David Eddings, and Ursula K. Le Guin. The idea of Eragon began as the daydreams of a teen. Christopher’s love for the magic of stories led him to craft a novel that he would enjoy reading. Christopher was fifteen when he wrote the first draft of Eragon and took a couple of years to self-publish it. In 2003 it was re-published by Knopf and has gone on to become an international bestseller. In 2007, it was also made into a film of the same name. OFFICIAL BLURB: One boy . . . One dragon . . . A world of adventure. FORMAT/INFO: Eragon is 507 pages long divided over fifty-nine titled chapters with a prologue. Narration is in the third-person via Eragon solely. There is also a map, a glossary, a pronunciation guide, a note from the author explaining this edition & lastly the acknowledgments section. Eragon is the first volume of the Inheritance series. October 22, 2013 marked the North American hardback publication of this edition and it was published by Knopf books for Young Readers. (b) This was a gorgeous special edition and being the book-whore collector that I’m, there was no way I could pass up this chance. 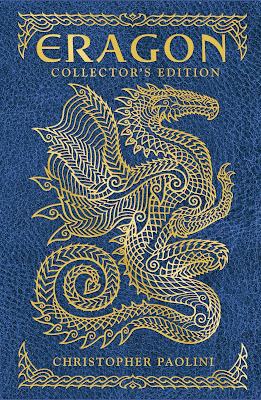 What I’m going to do in this review is that I’m going to focus simply on the story of Eragon and not the entire series and also stress the coolness of this special edition. When I had first read the story back in late 2003 in India, I had just about started reading fantasy and had recently finished Lord Of The Rings. I hadn’t seen Star Wars (the old and the new trilogy) and yet when I read this story written by a teenager, I found it to be an interesting read if not simply a good one. Did I see some of the similarities between Tolkien’s magnum opus and Paolini’s debut; the answer would be yes, but I thought at that point that this was an interesting version told by a kid as was The Sword Of Shannara. Fast forward to a decade later, when I’m re-reading this story after being massively disappointed by Eldest & giving up on the Inheritance series, still haven’t seen the Star Wars films and after reading quite a lot in fantasy. This time around my read wasn’t as smooth as my first one. Here’s what the gist of the plot is about. Eragon is an orphan living with his uncle and cousin Roran in a small village in the farther corners of an empire. His luck changes when he finds a smooth blue egg-shaped stone that hatches into a blue-scaled dragon. He bonds with the dragon who calls her Saphira and then learns about what it might mean to be a dragon rider if he can survive long enough in his training. That’s how the story begins and soon Eragon and Saphira will become famous all across the lands of Alagaësia but not everyone who seeks them is a friend. The story then twists and turns as the reader is strung along and soon discovers that there’s more to this story than what was assumed. The story is told entirely through Eragon’s eyes and thus the reader slowly gets introduced to the intricacies of the world and the magic within. The author takes care never to overwhelm the readers at any time while doing out bits of history and world info that are interlaced through the dialogue. The book has a reasonable pace that will keep the readers racing along and especially has a terrific, action-packed climax. This book also has six interior art pieces by these artists: John Jude Palancar, Michael Hague, Donato Giancola, Ciurelo, Raoule Vitale and one piece by the author himself. Another thing that works well within the story is the action sequences, the first half of the story is not quite action packed. But the second half more than makes up for it as the story races towards a terrific climax. The pace is also something that picks up as the story progresses and while it is a bit stagnant in the first few chapters, it does get better. Now on to the things that make this book such a divisive one, the book’s plot seems very akin to Star Wars and also seems to have a strong inkling of Lord Of The Rings with its generous usage of terms and names that sound a lot similar to those found in the seminal fantasy epic. There’s also the “orphan/chosen one“ trope that the plot heartily plays out on, while this would be entertaining if you are reading it for the first time. But after reading a reasonable amount of fantasy books, this trope as well the story doesn’t quite generate the same amount of attention. But here’s why I still think that this book deserves some accolades, it was written by a teenager (15-17) and on that level, it’s quite a fun read. Most writers don’t churn out original, path-breaking stuff during that age or much less get published with it. It’s to his and his parents’ perseverance that he got published and has gone on to such divisive fame (or infamy if you will, based on all the dislike as seen on Goodreads). So on that note, I must say that this book will continue to charm and inflame its readers but it can’t be completely discounted. This edition does spruce up that fact and so for readers who loved this story, this edition is a must have with its interior art. CONCLUSION: The 10th anniversary edition of Eragon is a fine one; it’s a nice homage to a book that launched Christopher Paolini’s career. This book doesn’t have changes in the story but combined with the cool interior art, it does look quite regal. Which I believe is what the publishers and author was aiming for. 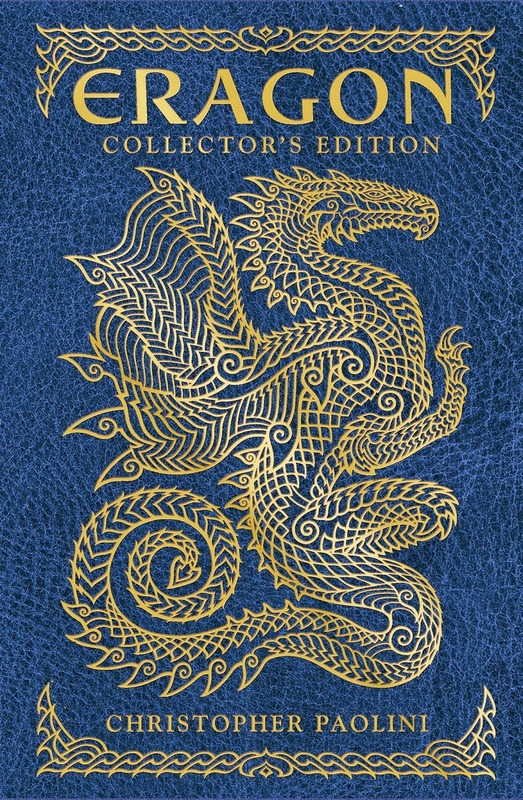 So Eragon fans, if you don’t mind the price, then this book is a cool addition to your library. it sure does look pretty!! I'm currently reading the Inheritance cycle, and I've quite enjoyed Eragon a lot. I wanted to comment because you said you gave up on the series after Eldest. and i can understand. I read erangon rather quickly, but then took more than double the time to get through Eldest. basically, nothing happens in it!! but i'm now halfway through the 3rd book and it's really really good! (also, very violent...) so i would say, give the story another try, if you're up for it! cheers! Thanks for your comment, I found Eldest to be quite silly and perhaps that was also due to me reading a lot other fantasy books. What also stops from reading books 3 & 4 is the massive reader displeasure at the climax of book 4. I rather have some good memories about Eragon than dislike the entire series so I'm happy with reading just the first two.